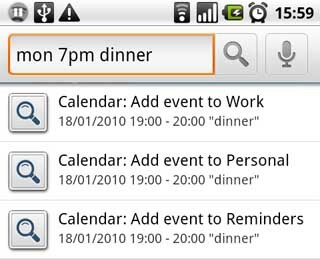 Searchify’s calendar entry feature lets you add new events to your phone’s calendar just by typing into the search box. For each calendar on your phone that you can add events to you’ll see an item in the search results. Just tap it to add the event. Events have to have a start date and a description, but the other bits are optional. If you don’t give an end time, Searchify sets a duration by default (usually one hour, but you can change this in Searchify Settings). If you want events created by Searchify to have reminders you can do this, just select the option in Searchify Settings. 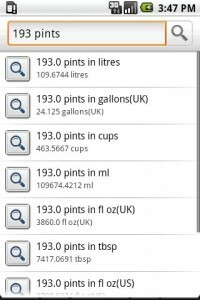 To use Searchify’s unit convertor, simply type a quantity such as “10 pints” or “2 miles” into the search box. Searchify will return a list of conversions for that quantity. Searchify recognises different ways of writing units, so you can enter “10lb” or “10 pounds”. 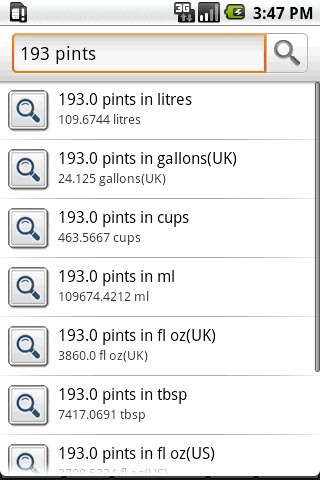 Searchify will try to work out whether you’ll prefer UK or US units for things like pints. If you want to change this, you can do so in Searchify Settings. If you’d like to see other units added, let me know. Searchify is slow, how can I speed things up? Some older phones (e.g. the G1) can take some time to process Searchify searches. Changing some of the options in Searchify Settings can speed things up though. The best way to speed things up is to add keywords to searches, particularly Wikipedia Search. For example, add a keyword of wiki to Wikipedia Search. This will mean the app won’t send a query to wikipedia for every letter you type. Adding a keyword to Calendar Entry might also help as that module does a lot of processing. How do I add a keyword? Go to Searchify Settings from the icon in the app launcher of your phone. Tap and hold on the ‘Wikipedia’ entry. Select ‘Set keyword’ from the context menu, and enter the keyword you want. How do I use Wikipedia Search once I’ve set a keyword of ‘wiki’? Just type ‘wiki’ before your search terms. E.g. “wiki henry” to search wikipedia for “henry”. Why can’t I see Searchify in the Market? Only phones running Android 1.6 or higher can run Searchify, so phones on Android 1.5 won’t be able to see it. The quick search box that Searchify enhances was only added in 1.6, so there’s no way the app can work on an earlier version. Unfortunately this means that currently the HTC Hero won’t run Searchify. Apparently HTC are planning to release an update some time in March. Can you make a Searchify widget? There’s no need for a Searchify widget, because Searchify integrates with the main Android search. So you can just type Searchify commands into the (Google) search widget that comes with the phone. Why do Searchify results only appear under ‘More results…’? When you first install Searchify, its results will appear under a heading ‘More results…’. This is normal behaviour for the Android quick search box. Android decides which search results to show in the main list of results, and which ones appear under ‘More results…’. Once you’ve used Searchify a few times, the first few Searchify results will appear in the main list. If there are many Searchify results, you might still have to tap ‘More results…’ to see them all. Why doesn’t Searchify return any results? Searchify has to be enabled in your phone settings for it to work. To do this, press the MENU key on the home screen, then tap Settings, then Search, then Searchable Items. Check the box next to Searchify. Don’t press return or the magnifying glass button after entering your search query! Just type in the query and wait. Searchify results (and other results) will appear below the search box. Also, note that in Searchify Settings you can disable search modules by unchecking the box next to them. Made Wikipedia Search direct to mobile wikipedia by default, with an option to use full wikipedia in the settings. The first release of Searchify!